When we went to AZ to visit the in-laws I was surprised to see this frame that I made my MIL over 8 years ago still on the bookshelf. Don't Jon and I look so young and carefree and how bout that magenta hair! I started with a plain wood picture frame that had a flat front, scour your local thrift shop there are usually tons of frames to choose from. I then painted the whole thing green and the inside lip of the frame I painted bronze. 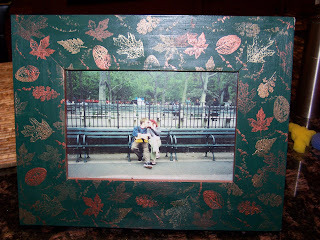 The leaves are done in acrylic paint with rubber stamps. If you find a frame at the thrift store remember to lightly sand the frame first to get off as much of the finish as you can before painting. Yes, it's that easy! These make great, inexpensive gifts. It would make a wonderful baby shower gift with a picture of the sonogram and baby themed stamps. Or as a wedding gift with the date stamped on the frame. The possibilities are endless! Hey! I took that picture!! Still one of my favorites!! !